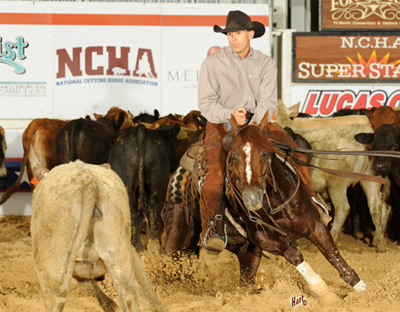 Rowdy Larson, Overbrook, Okla., pulled no punches in the Lucas Oil NCHA Super Stakes Limited Open Finals with a 222-point championship win on Johnny English and a 217-point lock on the reserve championship aboard Metallic Ina. Wes Ashlock, Abilene, Tex., placed third with 216 points on HC Tailgate Date. Johnny English LTE $18,620, sired by Metallic Cat, is owned by Nick Meagher, Antonito, Colo. Larson showed the sorrel stallion to win the Limited Open division of the 2017 Cattlemen’s Derby and to place fourth in the Open Derby. He also showed Smartt Catt LTE $19,257, by Metallic Cat, to win the 2017 Cattlemen’s Derby 5/6 Limited Open. Johnny English, a Western Bloodstock, Ltd. sale graduate bred by Crown Ranch, Weatherford, Tex., is out of Turtle Pie, by Son Ofa Doc, the dam of Jerryoes, 2001 NCHA Futurity Non-Pro champion under Chad Bush, owner of Crown Ranch. Apollo Creed, sired by Metallic Cat, owned by Nancy and Daniel Burkes, and shown by Brett McGlothlin to place fourth in the 2017 Super Stakes Limited Open Finals, was also bred by Crown Ranch. Metallic Ina LTE $12,902, sired by Metallic Cat, is owned by The Over Forty Ranch, Wichita, Kan. The red roan mare placed ninth in the Bonanza Open with Larson and fifth in the Arbuckle Mountain Limited Open. This was the eighth major limited open aged event win for Larson, who has NCHA earnings of $278,152. Johnny English and Metallic Ina also both qualified for the NCHA Super Stakes Open Semi-Finals on Friday, April 14.